If you remember the original deal regarding the troop surge back in January of this year, President Bush would send additional troops into Iraq to get the upper hand over the insurgency. Commanding General David Petraeus would oversee the operation and report back to Congress in September about whether the surge has made any headway. Naturally, the Dems can’t be trusted to make deals. In fact, they have been spending all the political capital they have to try and push several resolutions that call for troop withdrawals with deadlines ranging from one year to should-have-been-done-last-week. Why can’t they just wait another 30-45 days to hear what Gen. Petraeus has to say? Simple: because he is more than likely going to report to Congress that the troop surge is working to decrease attacks on American soldiers and Iraqi civilians, and the power of Al-Qaeda in Iraq (AQI). Yes, it does exist. Good news in Iraq translates into bad news for Democrats. They have staked their claim to power on a botched war in Iraq. If it turns out that we are making progress over there, then the Dems could lose one of their biggest electoral trump cards. I implore you to set aside 9 minutes to check out this YouTube video inspired by the opening monologue from the movie “Patton.” It speaks volumes of truth about the current state of affairs in our battle to the death with radical Islamic fundamentalists. 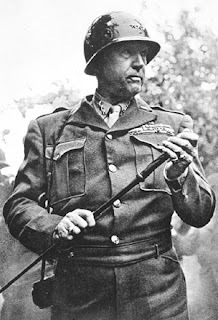 When Gen. George S. Patton joined the battle against fascism in World War II, he was not at a loss for words when it came to pacifism in the face of an arrogant, bloodthirsty, and dangerously savvy enemy. When the movie “Patton” was released in 1970, it won several academy awards and was rightly hailed as one of the greatest war movies of all time. This proved an interesting commentary on the times, considering the film was made and released during the height of the Vietnam War, when liberals and their fellow travelers on our university campuses cheered for American defeat in Southeast Asia . Now, the children and grandchildren of those who thought that peace could only come from America’s failure are hard at work compromising our safety and our dignity. This video will make you feel a little better about that by clearing the air. Ward Churchill gets the boot! The University of Colorado governing board finally came to its senses today and fired “professor” Ward Churchill for plagiarism and falsifying facts in his work. The vote was a clear 8 to 1 to oust this loser. Churchill has threatened to sue, but we’ll have to wait and see about that. It’ll be interesting to see how many of his leftist friends come to his defense. If they do, will it do them any good? The fact is that Churchill was not fired because of his infamous post-September 11th essay, “Some People Push Back”, but for intellectual theft and falsifying facts to fit his warped view of the evil American empire. That view is not real, so he had to make up his facts to fit his theory. He will have defenders, but anyone who wants to protect their own reputation in the university world is unlikely to tarnish it by being associated with him. Or at least that’s my optimistic, and maybe naive, opinion. We can debate that later. For now, let’s just rejoice in Ward Churchill’s firing. It was late in coming, but now that it has come, it still tastes good. New York, NY – The New York Young Republican Club will hold our July monthly meeting on Thursday, July 19, 2007. The featured speaker will be author, columnist and media commentator, Phil Kent. Kent will discuss his recently published book, Foundations of Betrayal: How the Liberal $uper-Rich Undermine America, which shows that the awesome power of unaccountable, tax-exempt, left wing foundations has grown to the point of becoming virtually a shadow government operation in America. Kent is the president of the Atlanta-based Phil Kent Consulting Inc. which specializes in media communications. Kent was an editorial writer, editorial page editor, and political columnist for The Augusta Chronicle for 25 years. He also served as president of the Southeastern Legal Foundation, during which time he oversaw a court win in Charlotte over an illegal affirmative action plan, the filing of a lawsuit against the city of Atlanta over illegal use of impact fees and assisted in the omnibus federal lawsuit to overturn the McCain-Feingold campaign finance act. He is the executive director of the American Immigration Control Foundation and the national spokesman for its sister group, Americans for Immigration Control. His first book The Dark Side of Liberalism: Unchaining the Truth was published in 2003. Please join us at the Union League Club, located at 38 East 37th Street, on Thursday, July 19, 2007, beginning at 7PM. Business attire required. Please check your coat at the door and turn off your cell phone. Our 95th Annual Dinner was a smashing success. One hundred guests braved the torrential downpour to make it to the Union Square Ballroom (some of us even sacrificed hair and makeup to the elements). Conservative talk-radio host Andrew Wilkow, host of ‘The Wilkow Majority’ on Sirius Satellite Radio, was a very entertaining Master of Ceremonies. Joseph L. Forstadt, Esq., was the Recipient of the Herbert Brownell Lifetime Achievement Award, for his ervice to the city of New York and the Republican cause throughout his career. Upon accepting the award, Mr. Forstadt spoke to the YRs about his tenure with the club – it’s always interesting to hear about what the club was like in past years. Andy K. Shenoy, a former advisor to Governor Pataki, was presented with the Nelson Rockefeller Award, which goes to a Republican who is a steadfast supporter of the Young Republicans. He has worked diligently to strengthen business ties between New York and India. Alanna Crawford was awarded the Sharon S. Thompson award, in recognition of her contributions to the NYYRC’s Community Outreach efforts. Alanna has worked very hard to recognize those that put there lives at risk to serve others and can frequently be seen at the end of meetings collecting goodies and having members sign cards to send to troops serving in Iraq and Afghanistan. Sharlene Santercole earned her second Stanley Isaacs Award, Wednesday evening. The Stanley Isaacs Award goes to the YR that has contributed the most to the club over the past year. It was an easy decision this year – Sharlene spent much of her spare time over the last two years not only filling the very time-consuming post of Membership Chair (most of the time without any co- or vice-chairs), but also helping out anywhere else she was needed. Also, President Emeritus Rick Brownell was passed the giant gavel given to all past Presidents to recognize their service to the club. It seemed to me that everyone had a great time, and I know that I had a lot of fun. (4 hours of open bar!) For those of you who weren’t able to make it, you missed a really great event and should definitely try to make it next year. Thank you to Sharlene, Kristin and the rest of the Dinner Committee for organizing an excellent event! New York, NY – The New York Young Republican Club will hold our 95th Annual Dinner on Wednesday, July 11, 2007 at the Union Square Ballroom. Conservative talk radio personality Andrew Wilkow, who hosts ‘The Wilkow Majority’ on Sirius Satellite Radio, will serve as Master of Ceremonies. Joseph L. Forstadt, a lawyer who has made a significant contribution to the city of New York, and Andy K. Shenoy, a former advisor to Governor Pataki who has worked to strengthen business ties between New York and India, will be presented with awards. The New York Young Republicans annual dinner will be held on Wednesday, July 11, 2007, at the Union Square Ballroom, 27 Union Square West, New York City. The event will begin with cocktails and the V.I.P. Photo Opp at 6:30 PM, followed by dinner, awards presentation & dancing at 7:15 PM. Tickets are $250 for non-members, $150 for members. Photo Opp is an additional $50. Business Attire. Please visit www.nyyrc.com to purchase tickets or email info@nyyrc.com for additional information. NYYRC ANNUAL DINNER NEXT WEEK! Members, Friends, Alumni & Supporters will all be attending the NYYRC’s GO TO EVENT OF THE YEAR — The Annual Alumni Dinner. If you haven’t been to one of these events, you must check it out… Dinner, Dancing, and Drinks, with a silent auction, top off a great night at a fantastic venue. with food that’s devine.